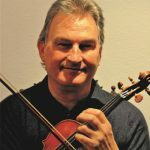 Melbourne-born violinist Brian Finlayson studied in Melbourne with Brian Blake and Dorothy Gleadall. He undertook further studies with Valery Klimov (a student of and successor to David Oistrach) followed by studies in Cologne from 1980 to 1983 with Igor Ozim, the Amadeus Quartet and Günter Kerr, performing concerts and touring throughout USA, Canada, France and Germany as a soloist and member of the Heidelberger Kammerorchester. Returning to Australia in 1983, he was appointed concertmaster of the Australian Philharmonic and the Australian Pops Orchestra. Dr. Mark Laycock is a Professor of Music at Wichita State University, where he holds the Ann Walenta Faculty of Distinction Endowed Professorship. He has been recognized with the WSU Excellence in Creative Activity Award (2012) and the College of Fine Arts Excellence in Teaching Award (2007). He serves as Director of Orchestras and Coordinator of Strings. 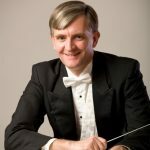 WSU Symphony Orchestra appearances under his direction include international tours to Spain and Canada, a May 2011 concert at Carnegie Hall, and multiple invited performances at Kansas Music Educators Association In-Service Workshops.